November brought both a massive milestone and mammal, but was relatively uneventful besides a few spectacular days. 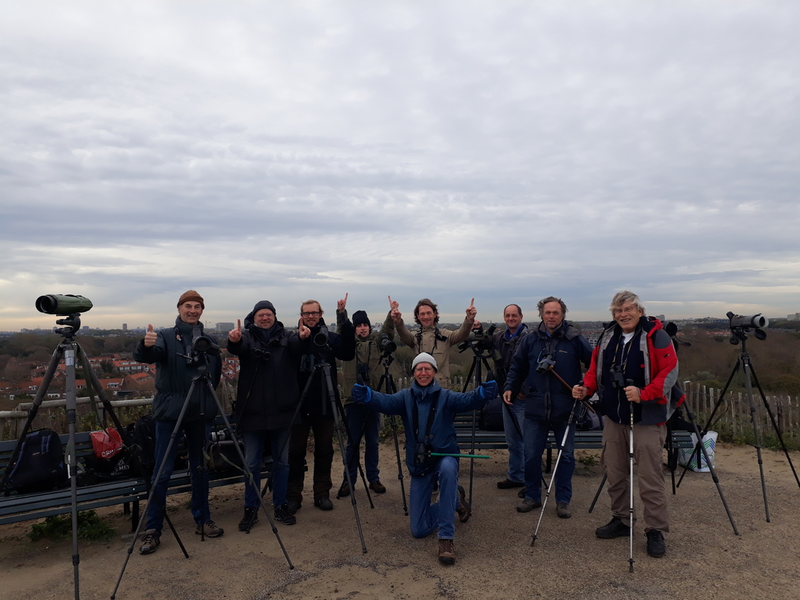 The team right after the 1 millionth Chaffinch was counted. Although I’ve had to miss the bulk of the passage, because I was enjoying raptor migration in Georgia, this autumn has seen unprecedented numbers of Chaffinches migrating past De Vulkaan. From 2007-2017, the average number of Chaffinches counted in autumn was just shy of 400.000 (399.486 in fact), a very respectable number and one of the specialties of our count site. But then 2018… On the 1st of November, at 09:22, during a sudden strong passage of finches, we counted the 1 millionth Chaffinch of the autumn! Truly an incredible number and probably a Western European record. Besides Chaffinches, the day brought a very nice diversity of species including 2 Olive-backed Pipits flying together (recording here), a Short-eared Owl, a Bohemian Waxwing, a very late Turtle Dove (unfortunately too distant for photos), loads of Blackbirds (554), Bramblings (6624) and quite nice numbers of Yellowhammers (6) and Hen Harriers (7). The latter were especially interesting with 2 individuals with a very warm colouration of the plumage, very little streaking and a clear hood with neck ring (both males), making confusion with a distant Pallid Harrier very easy. Another day with Red Kites (2), an Olive-backed Pipit, quite a few Hen Harriers (5) and very nice number of Lapland and Snow Buntings (10 and 5 respectively). But mostly: a nice, sunny, day with migration at just the right pace to be able to enjoy everything. Chaffinches against the skyline of The Hague. It is remarkable how close to one another Great White Egrets can fly. The day produced massive numbers of Great Cormorants (2583) migrating south, 2 late Marsh Harriers and good numbers of Northern Lapwings (242). Hen Harriers migration was great once again, with a total of 13 birds moving south. Despite the tendency of Harriers to migrate solo, we observed 3 tight groups of Hens flying together. They were so close, in fact, that they could be photographed with both of the birds in focus (photographer’s will understand this means they’re really quite close to each other). This autumn we have counted a total of 59 Hen Harriers, 38 of which (61%) could be aged confidently. Of these aged birds, 95% were juveniles. This fits the idea that juvenile birds are more likely to drift in the winds and thus show up with winds coming from the east more so than older birds do. Two juvenile male Hen Harriers flying so close together they can be photographed while both being in focus. And, as the saying sometimes goes: the best bird of the day was a mammal! The coastal region we are overlooking at our site was the temporary home of a Humpback Whale for quite a while already, but — having been busy with my studies — only this day I finally managed to see it. As of writing (December 4th), the whale has been foraging intermittently in the area for a month already. Update January 10th, 2019: Still present, along with another individual in North Holland. Later that day, the whale would be seen breaching multiple times in front of an ecstatic audience. Unfortunately, I had to miss that. Nevertheless, despite only being halfway the month, this was a nice sighting on my last proper count in November.